Now, Capitol Records is reissuing an expanded version of the album. As has been typical with other releases in the Paul McCartney Archive Collection, a two-CD set has been released alongside an even larger super deluxe three-CD + DVD set with books detailing artwork and a behind-the-scenes look upon the sessions. Additionally, you can grab two free downloads of demos not on any of these configurations so far through McCartney’s official website. Flowers In The Dirt often sounds of the ‘80s production era, from the go-go inspired “Rough Ride” to the drenched vocals on “Motor Of Love” to the avant-pop of “Ou Est Le Soleil.” Looking back upon his post-Beatles career, it falls in the upper middle tier of his work, behind such works as Band On The Run, Flaming Pie, Tug Of War, and Chaos And Creation In The Backyard. What was happening around him in the pop music realm of 1989 was a scene dominated by much younger competition with acts like Motley Crue, Bobby Brown, Prince, Madonna, Debbie Gibson, and Janet Jackson all notching multi-week runs atop the Billboard 200. Flowers didn’t even threaten the upper reaches of the charts in the US. Of the nine Costello-augmented tracks featured on the bonus discs, only four made it to the final album with the remainder filled with other McCartney originals. The strongest track, “My Brave Face,” which had been polished up and had saxophone added alongside a trademark melodic McCartney bass groove carried over from the full band demo, was wisely chosen as a single. The performance is ebullient even as the lyrics tell of a relationship on hiatus. The harmonizing featured on the chorus is infectious as are some of the instrumental passages. Just as charming is the McCartney-penned “Put It There” with its country-folk flare that’s married with an always-welcomed George Martin collaboration on orchestration duties. The song contains a vintage melody and arrangement that could have been placed on just about any pop album of his career. 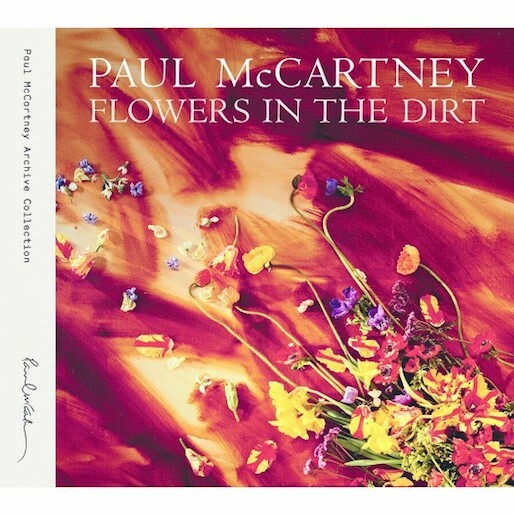 The gentleness heard within is summoned in reverence to his father, who inspired the title with a saying McCartney remembered from his childhood. While it was released as a single, what makes it a great song is that it feels as if it’s done with honesty as opposed to merely being from the output from a hit writing session. While a number of tracks do sound straight out of the ‘80s, not all have aged well. “Rough Ride,” with its slightly funky rhythm guitar and go-go drum rhythm alongside some well-placed horns, is an exception. The same can’t be said for “Don’t Be Careless Love.” Although the background vocals are a highlight, the backing track sounds thin and plodding. Similarly, “Motor Of Love” is weighted down by its length and sloppy lyrics. The melody is pretty enough, but what exactly does a motor of love have to do with the Heavenly Father from above? The song feels like it was written to be one to induce bringing out lighters to sway during a concert. In short, it tries too hard. Contained on the bonus discs of the “super deluxe” edition are two sets of demos of material the pair worked on, which help to craft a sense of how the tracks expanded from ideas into what they finally became on the album proper. The first set are what McCartney describes as “hot off the skillet” from September and October 1987 in the accompanying making-of booklet. The performances, which are previously unreleased, are primarily acoustic sketches performed solely by McCartney and Costello. Often sounding like a duo you might find trying out new material in a pub, there’s no mistaking that many of these are early versions in need of further tweaking. However, the original demo for “My Brave Face” is a real treat, with the pair sounding, dare it be said, Beatlesesque, especially as it transitions into the bridge. Months later in the first quarter of 1988, a full band was assembled to record fuller versions of the same nine tracks. “Don’t Be Careless Love” developed a pseudo-reggae rhythm, a genre McCartney had dabbled in on more than one occasion; Costello’s vocal contributions were nixed in place of McCartney singing solo on “The Lovers That Never Were” (which later appeared McCartney’s Off The Ground in 1991); “So Like Candy” gained more verve (but again wouldn’t appear until it was re-recorded by Costello for Mighty Like A Rose). What’s telling, though, is that almost 30 years later, he’s still putting out albums that garner critical appraisal while the acts that were dominating the charts have either passed away or have considerably faded. It’s not just because he was a Beatle; it’s because he’s one of the finest song craftsmen of the past five decades. Flowers In The Dirt shows us a handful of examples of that talent, even if the set on the whole is slightly spotty.